Since the discovery of Zika in 1947 in Uganda, no cases of microcephaly or death have ever been recorded, until 2015. Naled spraying is being justified due to supposed risk to the public health however, for sixty nine years, Zika virus has never posed a health risk. The confirmed symptoms are mild (fever, rash, joint pain and red eyes) that lasts less than a week, not microcephaly or death. Evidence shows the Zika virus is one of the most harmless viral infections, with approximately 1 in 5 individuals showing any symptoms of infection. Common sense begs the question, “Why would the Zika virus suddenly start causing brain damage, despite years of circulation with no prior history of serious negative effects?” and "why are we rapidly approving toxic aerial spraying with no evidence of posed health risk?". New England Journal of Medicine (NEJM), researchers evaluated 11,944 pregnant women from Colombia, all infected with the mosquito transmitted Zika virus. The study found not a single case of microcephaly in their new born babies. Given the mounting evidence disproving a direct link between Zika and microcephaly, it’s time to stop the unnecessary aerial spraying of Naled. So if Zika virus isn't a public health risk then what is causing rise in microcephaly? 18 months ago, Pyriproxyfen was recently added to drinking water in Brazil to kill mosquito larva. The way pyriproxyfen works is, its intended to kill larva aka baby mosquito from developing into a mature mosquito, thus causing intentional developmental abnormalities. Intriguingly, human and insect genetic coding is roughly 60% the same. But Sumitomo, the chemical company that makes the pesticide has denied this link. However, internal lab results indicate that rats fed pyriproxyfen produced offspring with microcephaly just like babies. Nevertheless, further testing needs to be done. What we do know, is that vaccines can cause brain damage and have never been studied on pregnant women. Despite lack of study and ethics, Brazil MANDATED vaccine (Tdap) for pregnant women in the late 2015 which is being linked by Brazil and Argentina doctors, as the real cause of microcephaly. So what's so bad about Naled? Naled, is a neurotoxin that contains Trichlorfon, which has been associated with an increased risk of cancer, autism and birth defects. 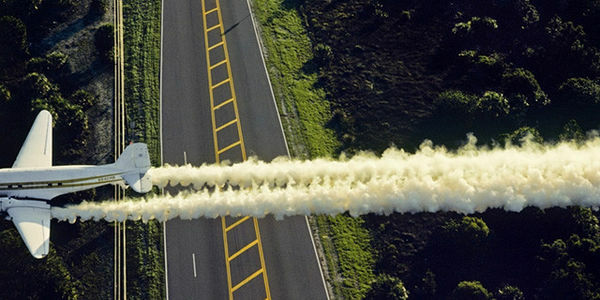 Even if we dismiss the fact that Naled kills important pollinators like bees and butterflies, exposure to commonly used chemicals such as pyrethroids and the organophosphate trichlorfon could have severe negative long-term health effects on us humans and we Floridians are AGAINST Nalen! The overwhelming evidence suggests Zika virus is NOT the cause of microcephaly and we the proud people who call Florida home are demanding that Naled spraying STOPS INDEFINITELY. So if Zika virus isn't a public health then what is causing rise in microcephaly? URGENT! Miami Beach needs your immediate help! There will be a VERY important meeting @ Miami Beach City Hall this Wednesday Sept 14th, regarding the County/State's unilateral decision to spray Naled. They've scheduled 8 sprays over the course of this month and so far 2 have been done (they're dousing them with this neurotoxin with ZERO regard). Protest will begin at 8am.